Mindfulness, an important aspect of positive psychology, was originally introduced by the ancient teachings of the Buddha. In Buddhism, mindfulness is cultivated through meditation. In modern times, other forms of mindfulness have taken hold. For example, the Hindu tradition of yoga has gained traction as a mindfulness practice that also can improve physical health. Exploring mindfulness and its roots in Buddhism and yoga will aid in understanding the role it can play in the field of positive psychology. In Buddhist teachings, human beings are presented as vulnerable and susceptible to experiencing pain and unhappiness. Buddhism teaches that to overcome these negative experiences, we must understand the origin of suffering. People have many cravings, whether biological, ego-driven or culturally conditioned. We all aim to avoid threats to our well-being (e.g. pain). The goal of Buddhism is not to control cravings but rather to transform them and detach from them, and eventually experience happiness that is independent of them. Yoga is a practice that utilizes both the mind and body to promote better mental and physical health. It includes physical postures that encourage strength and flexibility, breathing techniques, and mindfulness and relaxation practices. Together, the components help practitioners train their attention (Noggle et al., 2012). Yoga has two main principles that align with Buddhism. First is the liberation from suffering. Second is clearing the mind of misconceptions, which reduces cravings and eventually helps one realize Atman, the yogic concept of the end of suffering. The fundamental themes of self-discipline, mindfulness, concentration and “being in the present” are common to Buddhism and yoga philosophy. Those themes are related to the positive psychology concepts of self-control and flow (Ivtzan & Papantoniou, 2014). But perhaps the most important connection between yoga, Buddhism, and positive psychology is the practice of observing and changing thought patterns. According to Levine (2011), common concepts to yoga philosophy and Buddhism are inner well-being and having the “right” thoughts. 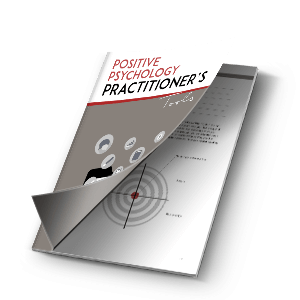 In the field of positive psychology, psychologist Martin Seligman presents a similar idea: Thinking patterns that are “wrong” or pessimistic can lead to suffering. Methods of treating depression have long relied on the same concept. Clients are first made aware of thoughts that are incorrect then are taught how they can transform those thoughts. In this way, clients start to become mindful of their thought patterns and begin making important changes in their emotional and mental states. In addition, a study of the relationship between yoga, gratitude, and finding the meaning of life revealed that there was a strong correlation between regular yoga practice and “higher reports of meaning of life’”(Ivtzan & Papantoniou, 2014). According to Buddhist philosophy, suffering is unavoidable. There is evidence of this in our daily lives — we often face challenging circumstances that we cannot control. Being mindful of our thought patterns can help us transform our suffering into well-being. And luckily, mindfulness can be cultivated through different methods. Even if you are a dedicated practitioner of traditional Buddhist meditation, you may like yoga as well. It not only helps you stay fit — it also helps you develop mindfulness, increase your gratitude, and improve your sense of meaning in life. Levine, M. (2011). The Positive Psychology of Buddhism and Yoga: Paths to a Mature Happiness. New Jersey; Lawrence Erlbaum Associates. Noggle, J., Steiner, N., Minami, T., Khalsa, S. (2012). Benefits of yoga for psychosocial well-being in a US high school curriculum: a preliminary randomized controlled trial. Journal of Developmental & Behavioral Pediatrics, 33(3), 193-201. Ivtzan, I., Papantoniou, A. (2014). Yoga meets positive psychology: Examining the integration of hedonic (gratitude) and eudaimonic (meaning) wellbeing in relation to the extent of yoga practice. Journal of bodywork and movement therapies, 18(2),183-189. To suffer you must do suffering. To enjoy you must do enjoyment. Try sitting for a while. Buddhism meditation and yoga are really useful for our daily life. Buddhist meditation is a variety of meditation technique that aims to develop mindfulness concentration, tranquility and insight. Buddhism meditation and yoga both are very useful to reduce your suffering and cleaning the mind of misconceptions. I really like your article. Good one!